Painted near the end of Scauflaire’s life, when he was 65, this work is firmly in the mainstream of his output, both technically and stylistically. 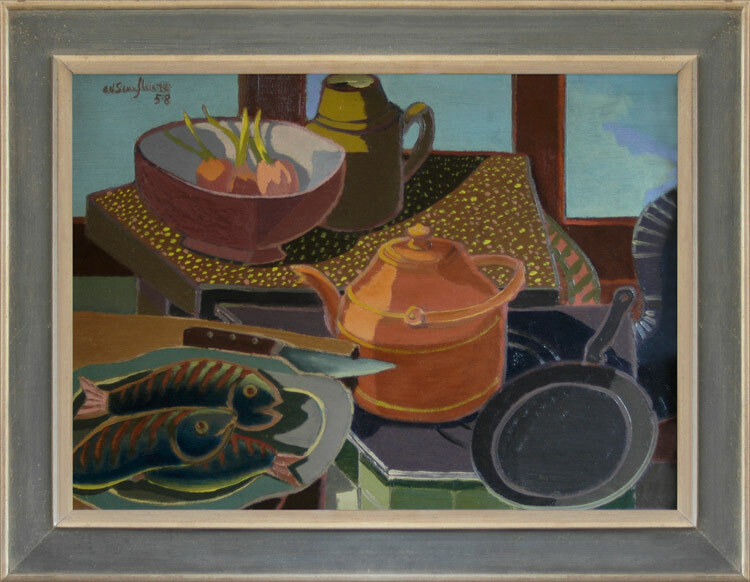 The assembly of domestic objects seen at close range within a suggested interior, the earthy colours, the varying perspectives within the arrangement, and most of all the acute sense of pattern, are present in works such as Nature morte aux gants (1919? ), Bouquet dans un vase (1920), Nature morte au gateau, and Still life with three oranges (1953). All these convey a confidence in his ability to translate a three-dimensional group of objects into a flat decorative surface, where harmony of colour reconciles the tensions of an ambivalent space. The current work, with its extremely subtle and unified colour range, is a particularly sophisticated development of Scauflaire’s vision.